AMD-only. 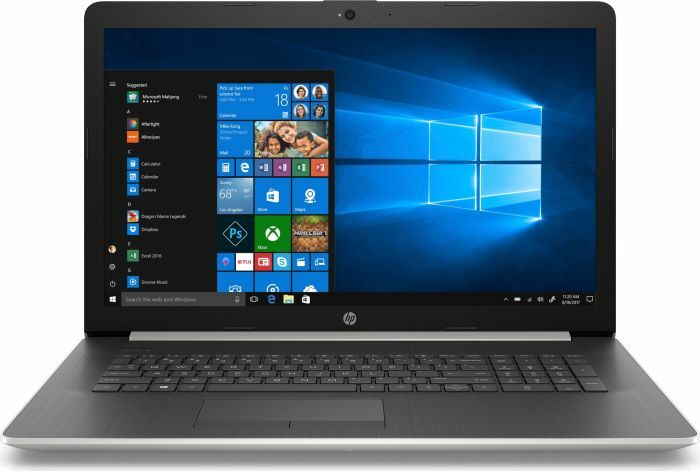 After some mixed reviews of their first version HP has now released a new HP 17 with all-out AMD components and an IPS panel. It does certainly offer some improvements, but does not come without any backlash. 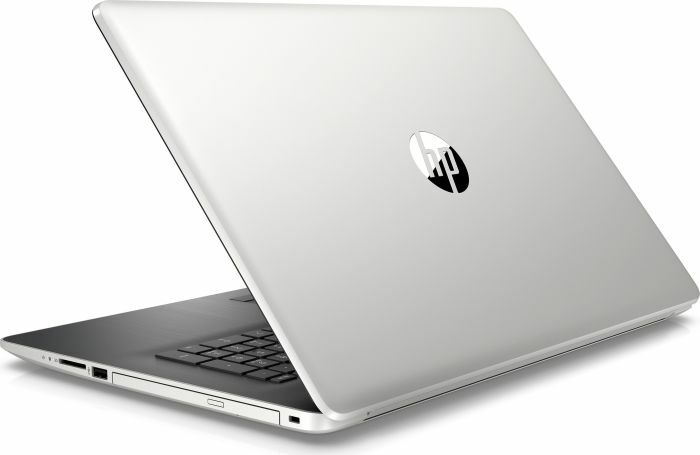 We have already had HP’s 17-inch notebook in review. The last model, reviewed in 2017, was equipped with an Intel Core i5 CPU and an AMD Radeon 530 GPU. Its biggest weakness was the poor TN panel. Today’s review unit features a high-quality IPS panel, a much more powerful AMD Ryzen 2500U CPU, an AMD Vega 8 GPU, a 256 GB large SSD, and a 1 TB large HDD. Compared to last year’s model, we expect a substantial performance boost due to its much faster components. The price has remained the same, and our particular review unit sold for 700 Euros (~$794) at the time of writing. Given that the case has remained practically unchanged from last year’s model we would like to refer you to our previous review for further details. 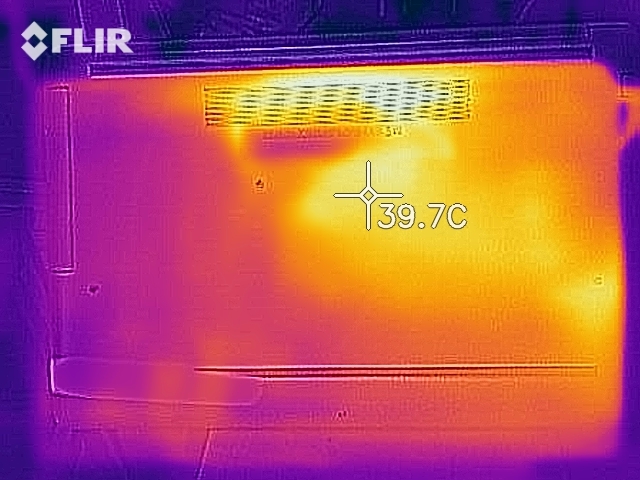 The one thing that has changed is the port placement: all left-hand side ports have been relocated towards the rear, and the fan no longer vents to the left side. 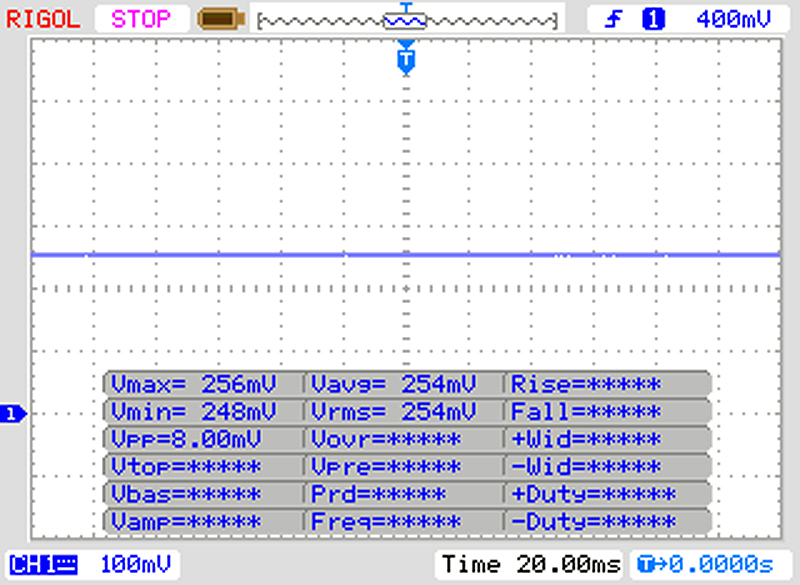 The SD card reader performed better than last year. In our JPEG copy test, conducted with our 64 GB Toshiba Exceria Pro SDXC UHS-II reference card, it managed 34 MB/s compared to last year’s 23 MB/s. However, despite its improved performance the card reader still remained below average for its class. Wi-Fi performance has also been improved somewhat and is now at around 200 Mbps out of a possible maximum of 433 Mbps. Today’s review unit features an FHD IPS panel with wide viewing angles. Last year’s TN panel turned out to be very dark and very poor overall, and this year’s IPS panel is a massive improvement. 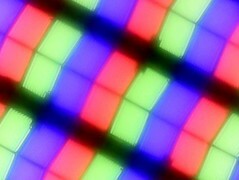 Its average brightness of 350 nits means that it can be easily used even in brightly lit environments, and its contrast ratio of 1,100:1 is more than just competitive. Out of the box, grayscale and color deviations were comparatively high for an IPS panel, and we also noticed a slight blue tint. 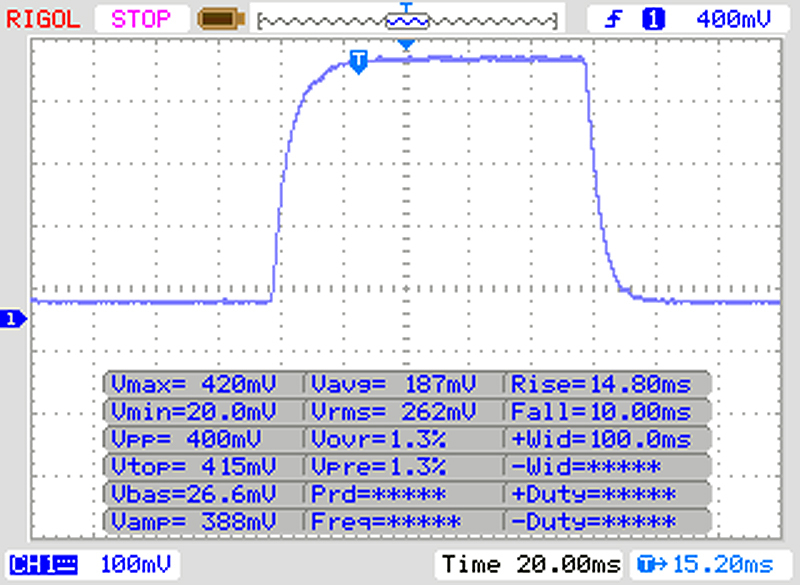 We were able to improve upon DeltaE deviations through calibration. 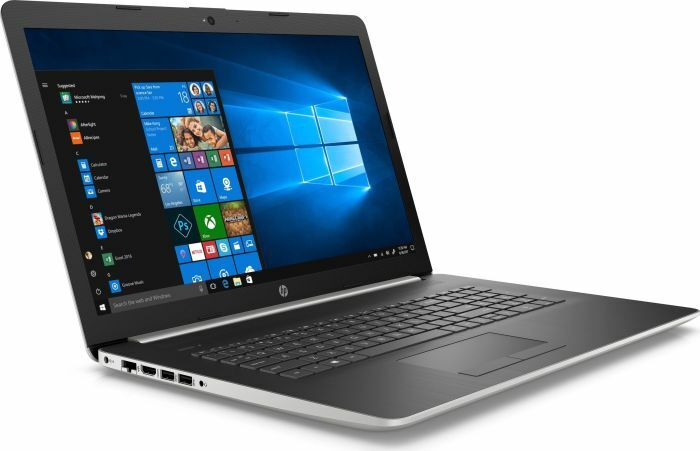 HP’s latest 17-inch laptop is a true AMD-only device. At its core, it features a Ryzen quad-core CPU accompanied by a mid-range Vega RX GPU, two 4 GB DDR4 memory modules in dual-channel mode, and a combined SSD/HDD storage solution. The system is aimed primarily at multimedia users with occasional gaming ambitions. At the time of writing our review unit sold for 700 Euros (~$794). Four cores running at clock speeds of between 2 and 3.6 GHz should be a worthy replacement for Intel’s Core i5-8250U that last year’s model was equipped with. 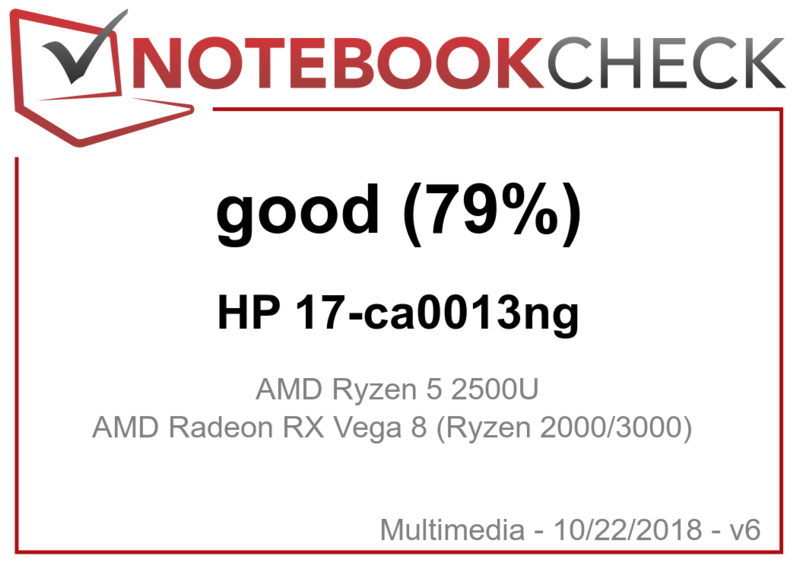 At least on paper AMD's Ryzen 5 2500U should be more or less on a par with Intel’s Core i5-8250U. It managed to outperform its Intel competitor in Cinebench R15. However, it scored similarly in our sustained load scenario, and both systems yielded around 510 points. More information on this and other CPUs can be found in our benchmark charts. System performance is the sum of all components. 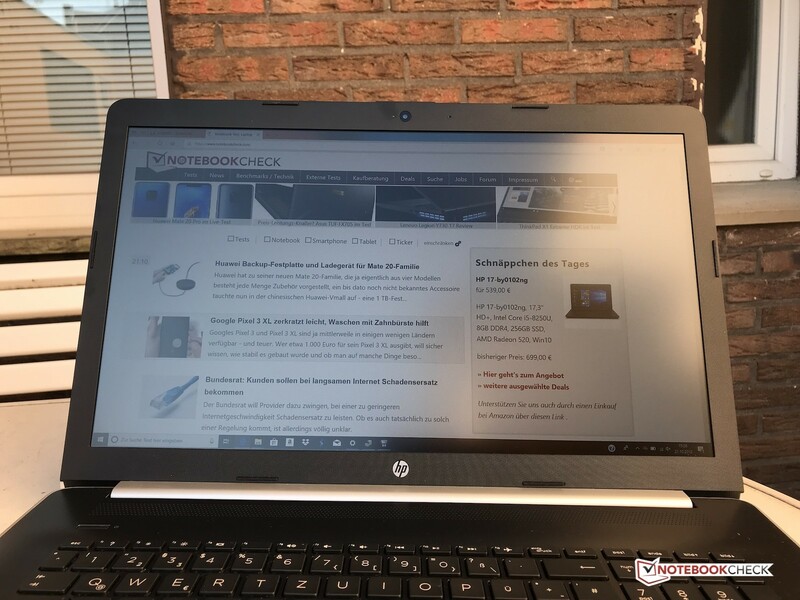 A fast SSD, a powerful GPU, and a decent CPU should make for a smooth and enjoyable office application and web browsing performance. 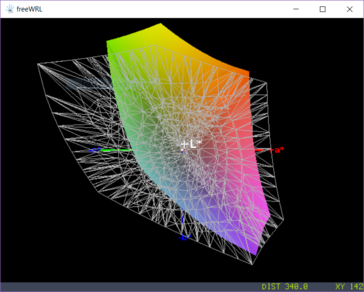 Accordingly, the HP 17 scored almost 3,500 points in PCMark 8. 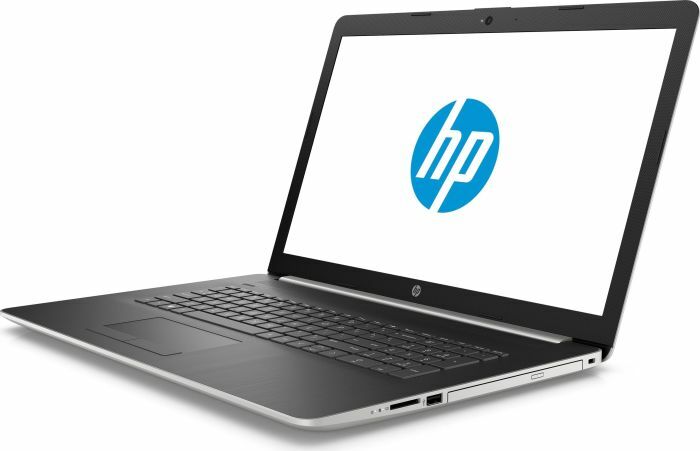 The HP 17 features two storage devices. A 256 GB large PCIe SSD with read speeds of up to 1,000 MB/s and write speeds of up to 800 MB/s, and a conventional 1 TB large HDD for additional storage. The operating system is installed on the SSD resulting in snappy and quasi instantaneous handling. All things graphics are handled by the integrated AMD Radeon RX Vega 8 GPU. This mid-range GPU has replaced last year’s Radeon 530, which it managed to outperform by more than 50 % in 3DMark 11. Gaming is certainly possible with the Vega 8, although more demanding modern games might require a reduced resolution and/or reduced details. More information and additional benchmarks can be found in our benchmark charts. Older games, such as “BioShock Infinite” or “Rise of the Tomb Raider”, ran very smoothly even on medium settings. Please note that our review unit did not allow us to select a resolution of 1366x768. Accordingly, we were not able to run our entire benchmark suite. 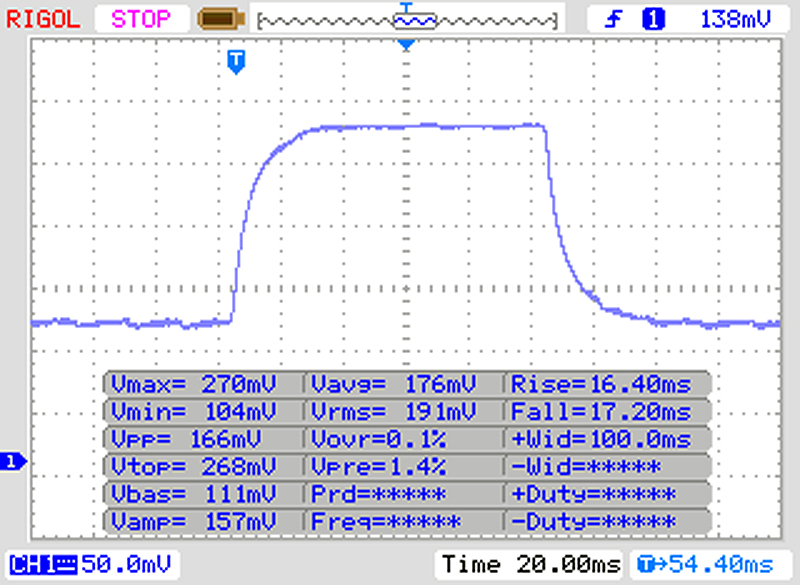 As with the previous model the single fan was always on, and it still behaved rather squirrelly. Just by launching an application you could already hear the fan speed increase. 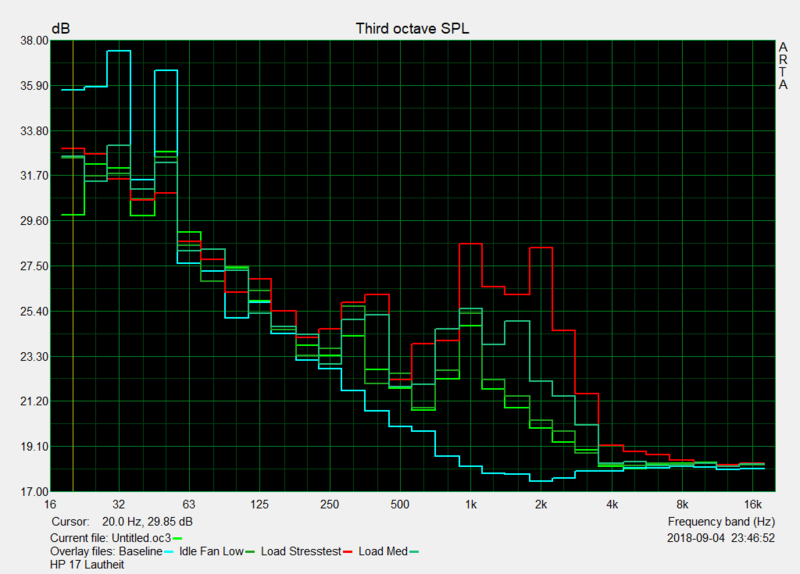 Fortunately, it remained largely unobtrusive and reached a maximum sound pressure level of just 36 dB(A). (+) The maximum temperature on the upper side is 37 °C / 99 F, compared to the average of 36.5 °C / 98 F, ranging from 21.1 to 71 °C for the class Multimedia. 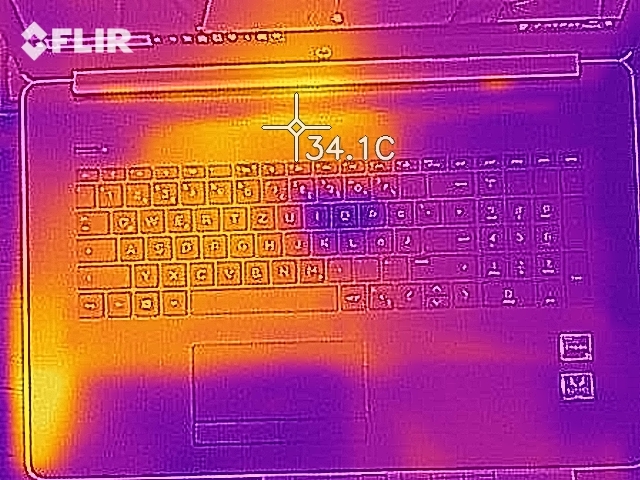 More performance equals higher temperatures, and accordingly our review unit’s keyboard surface heated up to a maximum of 37 °C (~99 °F) under load. While surface temperatures were comparatively low, overall internal temperatures were much higher. 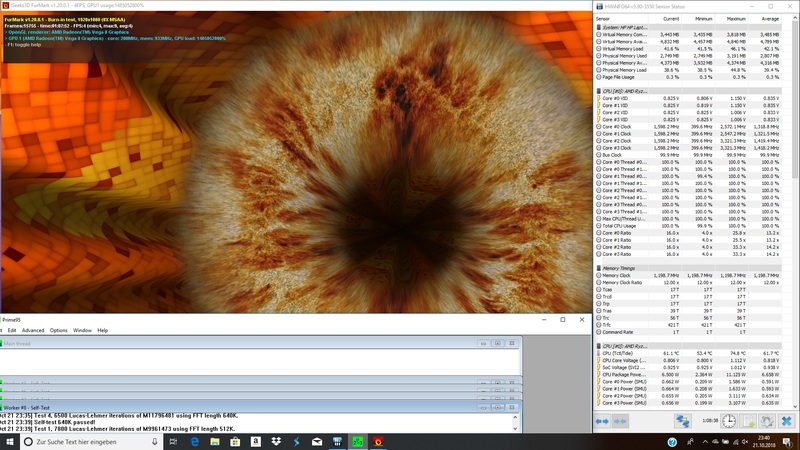 When running Prime95, the CPU started to throttle pretty much immediately and occasionally reduced its clock speed to just 400 MHz. On average, clock speeds settled at between 1.3 and 1.4 GHz after a full hour. 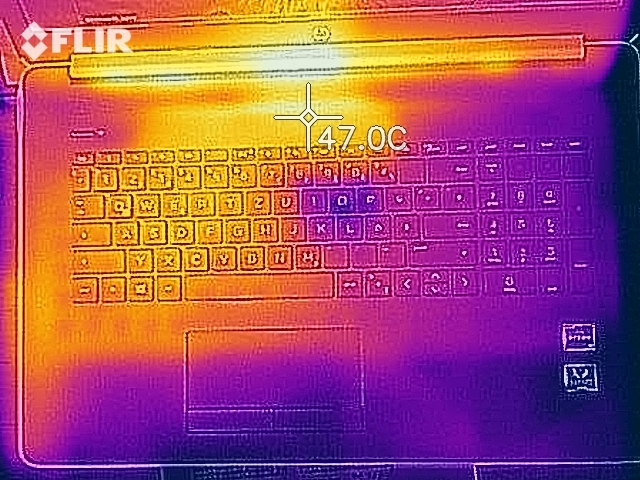 We were surprised by the fact that a 17-inch notebook was incapable of dissipating the heat appropriately. Running our benchmarks immediately following the stress test yielded scores of around 10% less than before. 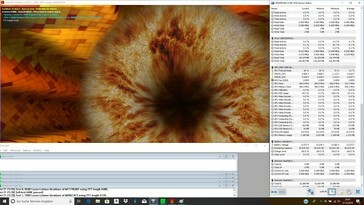 The fans slowed down almost instantly, but 3DMark 11 failed to match its previous scores. ... struggled during our stress test. 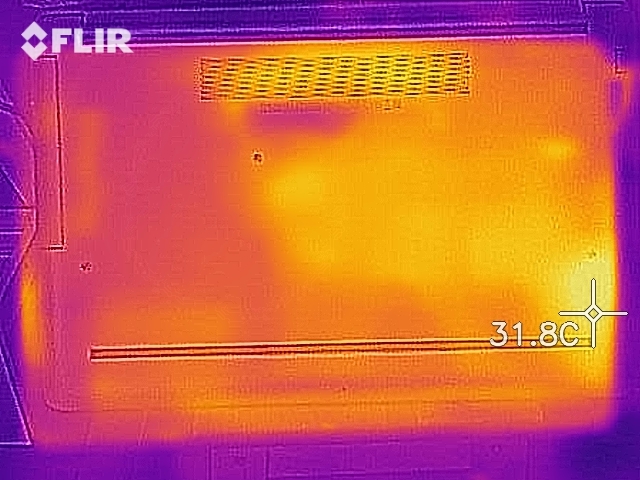 Not only did our review unit get warmer than its predecessor, its power consumption also increased. 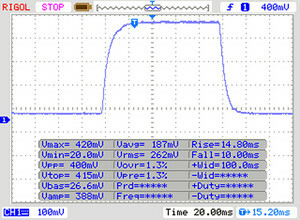 When idle, the power meter read a surprisingly high 13.7 W. Under load, this peaked at a maximum of 57 W. Given that the CPU throttled under load, power consumption oscillated wildly between 29 and 57 W.
Given its more powerful components, its increased power consumption, and its identically dimensioned battery, it came as no surprise to us that battery life suffered as a consequence. 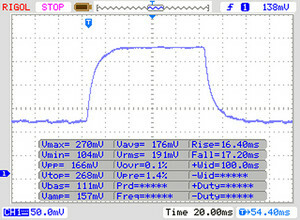 The HP 17 lasted for just 3:45 hours in our Wi-Fi test, and was outperformed by its predecessor by a whopping two hours. Overall, the new HP 17 is a step in the right direction. 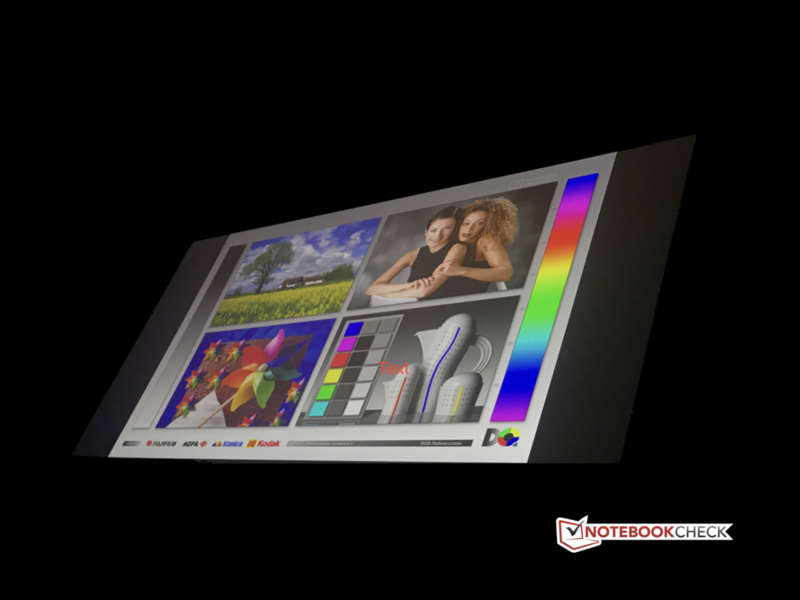 In most aspects the 17-inch large multimedia notebook has improved upon its predecessor. A USB-C port is still missing, however the slightly improved case left a good impression. We liked the new display in particular - this is the display that last year’s model should have already been equipped with: a panel that fits today’s requirements in terms of brightness and viewing angles. 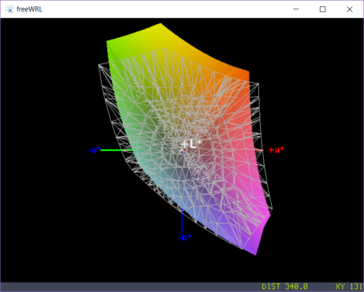 However, it did require calibration with a spectrophotometer, and the resulting ICC profile can be found for download in the box above. CPU and GPU performance have increased significantly, and so did overall system performance and versatility thanks to its fast SSD and large HDD. All this extra oomph comes at a price, and emissions and battery life have suffered accordingly. 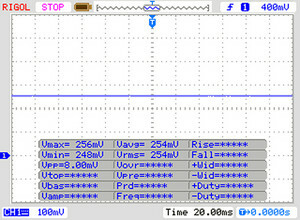 The CPU throttled under high load and the battery life was very poor. 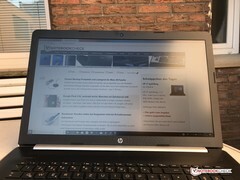 The HP 17 is a decent multimedia notebook, aimed primarily at users looking for a large and mostly stationary desktop replacement. 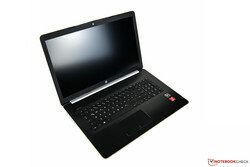 Alternatives include the Acer Aspire E5-774G. Further details can also be found in last year's HP 17 review.